Former Wallabies forward and assistant coach Jim Williams believes a starting back-row featuring Michael Hooper and David Pocock can work but should be considered only on a case-by-case basis once the opposition's forward strengths have first been identified. Australian rugby has been abuzz this week with speculation the star opensides may both be named in the run-on side for the Wallabies' Rugby Championship clash with Argentina following their exploits in the closing stages of last week's thrilling win over South Africa. Coach Michael Cheika is believed to be seriously considering the combination for the Mendoza clash, particularly after saying he saw "no risk" in starting two specialist opensides. Many pundits believe the combination, at the very least, deserves to be trialled; Williams, who played 14 Tests for the Wallabies and assisted Robbie Deans at the last Rugby World Cup, agreed it was too tempting a combination not to be given the green light but also hinted it wasn't a selection call he'd like to see used against everyone. One of the leading arguments against a Hooper-Pocock combination is the reverse effect on the set-piece, particularly the lineout. But it didn't seem to affect the Wallabies against the Springboks, as the pack was perfect on their own throw and the scrum actually forced a couple of penalties of their own - seeing replacement front-rowers Scott Sio and Greg Holmes earn plenty of praise. The Wallabies forwards face a similarly stern set-piece challenge against the Pumas in Mendoza on Saturday despite the South Americans' unusually subdued showing in that area in their 39-18 loss to the All Blacks in Christchurch. If Cheika does opt for a starting combination of Hooper and Pocock this weekend, it may prove to be an indicator as to whether such a formation can be implemented against Australia's key World Cup pool opponents, England and Wales. "The set-piece is going to be important; the lineouts, scrums, they're going to be vital," Williams said of the World Cup. "And I think looking at the pool with England and Wales; that'll be two areas where they'll target massively. And if we can adapt to that and make sure our set-piece is strong, and I'm sure it will be with [Mario] Ledesma involved in that side of things, they're on track to do that. I think they can just build up nicely." The Wallabies have a fortnight's break after this weekend's match against Argentina before they meet the All Blacks in back-to-back Bledisloe Cup Tests in Sydney and Auckland. A one-off Test against the United States in Chicago provides the Wallabies a final warm-up match before their World Cup opener against Fiji on September 23. 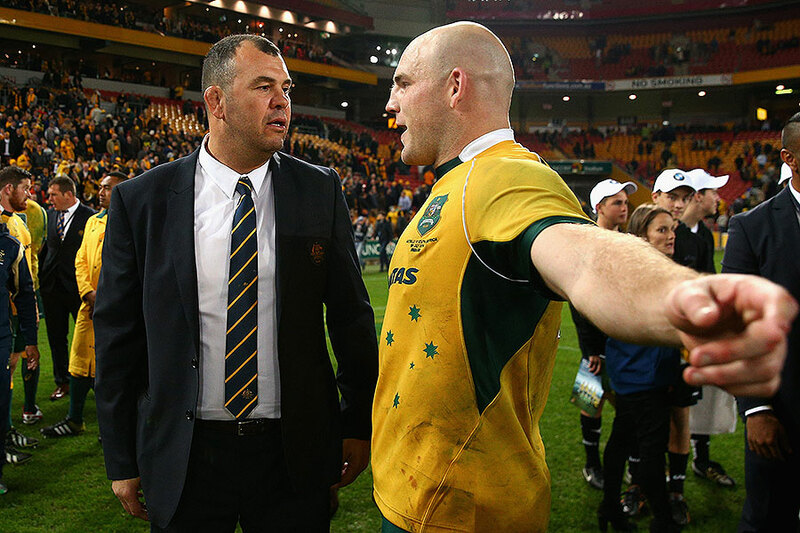 Looking back on his time under Deans at the Wallabies, Williams said the experience of the 2011 World Cup in New Zealand had proved invaluable for his own coaching career; but he has no advice for Cheika as the Wallabies boss prepares to apply the final touch to Australia's 2015 campaign. "I'm in no position to be giving Cheik advice; he knows what he's doing," he said. "The one thing about him is that he's got a vision and he'll stick to it, and I think it's important for that. He knows what he wants to do, and it's a simple thing to say 'we want to win the World Cup'; but I think he's got a plan in place and the biggest thing is that he'll get the right people involved that can do that. "And I think the quality of player they've now got involved there … there are point-of-difference players like Israel [Folau], and hopefully Kurtley [Beale] coming back. There's not just one or two or three [threatening] areas; there are six, seven, eight points of difference in that team now, and with a lot more experience, and I think that's going to hold them in great stead moving forward."